Most electrical appliances are rated in kilowatts and there should be a label on the back or side of the appliance stating how many kilowatts the appliance consumes when operating. In some cases the manufacturer will only provide the voltage and amp draw. This is enough information to calculate watts. Watts is the voltage x amps. However, your electrical utility sends you a bill based on how many kilowatts you used per hour and then multiplies that against an hourly kilowatt rate. That rate, depending on where you are located and whether or not your utility uses smart meter technology can vary, in North America, from 6 cents to 20 cents. The question that confuses many individuals is: "What is a kilowatt hour (kWh)?" 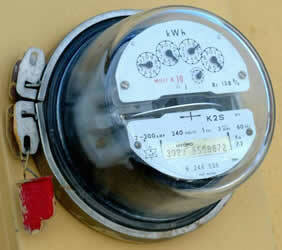 A kilowatt hour of electricity is the consumption of electricity, of a specific appliance, for 1 hour. As an example, if you are operating an electric washing machine that states that it is consuming 3 kilowatts of power, that rating means that the washing machine, if run continuously for 1 hour will consume 3 kilowatts of electricity and you would be billed for 3 kWh of electricity from your local electrical utility. However, a washing machine does not generally run for a whole hour. A washing machine, depending on what wash settings and cycles that you have chosen, may only run for 40 minutes. In this case the washing machine would only consume 2 kWh of electricity for each load of laundry that it washes. If you were to do three loads of laundry, the washing machine would operate for 1 hour and 40 minutes and would consume 5 kWh of electricity. Note: This of course does not include the electrical costs associated with creating the hot water needed for the washing machine, if in fact your home is equipped with an electric water heater. That is why a 1,500 watt toaster will not cost you as much to operate as a 1,500 watt baseboard heater. The toaster may operate for 5 to 10 minutes each day and the baseboard heater may operate for hours each day. You should also be aware that energy consumption values on many appliances, including Energy Star in the United States and EnerGuide in Canada and the U.S. are not realistic. Energy Star and EnerGuide energy consumption values can only be used as a comparison of appliances. As an example, a refrigerator that is Energy Star or EnerGuide rated at 700 kWh for a year would use that amount of energy providing the refrigerator and freezer doors are never opened. Neither one of these rating methods takes into account the recovery energy needed when a refrigerator or freezer door is opened.